Swag and promotional items are a common entity of any trade show, convention or conference in North America. Often you can walk a showroom floor and collect a bag full of pens, notepads, key chains, mouse pads, and bracelets, all of which will soon be left in hotel rooms, tossed out back at the office or distributed to co-workers and your kids. If you want to make a connection with your audience and give away a swag product with a higher ROI, you need to keep reading. Then you need to check out some sticker swag. Your swag item should be a product that aligns with the audience to whom it is being distributed. Do not hand out candy at a dental conference. Do not give away purse clips at a car show. If you exhibit at events with a variety of attendees, then stickers are a fairly safe bet. No one can resist a cool design with sticky adhesive. Everyone loves stickers. Vinyl stickers are durable. If you're giving them away for free, then your budget for swag items is likely limited. Which means you're going to cheap out and buy the less expensive products from the promotional products supplier. these will break or tear and be thrown out in days. Vinyl stickers stick great, are waterproof, UV resistant and heat proof. They will outlive cockroaches in a nuclear explosion. And when the few surviving humans rise from their safety bunkers deep underground to survey the detriment, they will see a lovely, custom sticker of your logo. For how durable they are, they are also surprisingly inexpensive. 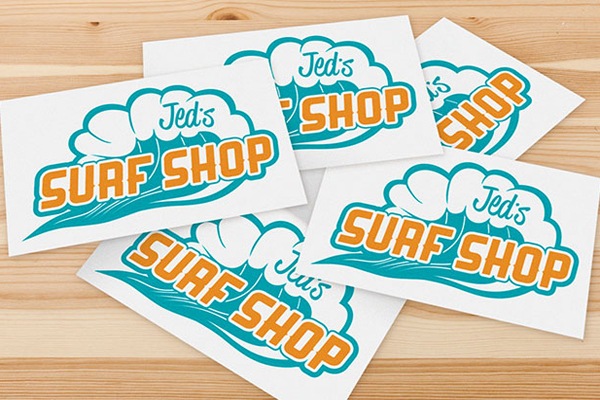 You can order hundreds of high-quality custom stickers for less than any other promo product. These stickers, by their very definition, get stuck to things like laptop covers, notebooks, desks, filing cabinets, street signs, hydro poles, building walls, etc where they are a constant sight of passersby. Do you realize the incredible amount of reach that gives your branding? Now compare that to how much money you spent on custom sticker swag. Stickers are small and fairly light. When your target audience is at a conference, or convention or trade show all day, they might opt out of the heavier or bulkier items that will take up space in their bag. Stickers take up barely any space at all and their weight is almost imperceptible. Thus your audience may feel more inclined to take one or two. It's easy to keep consistency with stickers. If you are working with a designer or a print shop, you can usually use PMS colors or CMYK conversions to match your sticker colors to your business branding. Stickers can also be scaled to a wider variety of sizes than mouse pads, pens or bracelets. Options are good. The turnaround time for stickers is fast. We can't speak for other sticker printing companies, but at StickerYou, from the time you place your order, until the time you are unwrapping your new custom sticker swag, in your own hands, in your own office (we deliver right to your door), is mere days. So if you just so happen to forget to order swag amid all your other superhero responsibilities, we've got you covered. Have an idea for your sticker swag? Talk to one of our handy staff. We've been to a lot of trade shows and conferences ourselves so we fully understand your plight in finding appropriate and effective swag. We're here to help. Just send an email to [email protected] and we will be in touch very shortly.